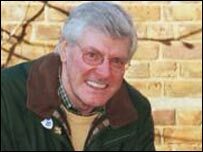 Former Blue Peter presenter Peter Purves watched as firefighters fought to save his Georgian House in Suffolk after part of an annexe became engulfed in flames. Five fire crews were called to the Grade II listed house at Sibton, near Peasenhall, after a fire started at about 1240 GMT on Thursday. Firefighters managed to save the main property, but the annexe where Mr Purves' mother-in-law lives was left badly damaged. An electrical fault in a bedroom in the annexe was believed to have been the cause of the fire. Mr Purves said he was fortunate the fire service had acted so quickly and had managed to save the home where he has lived for four and a half years. He told BBC Radio Suffolk as firefighters arrived, flames were pouring through the upstairs bedroom where the fire first took hold. "The firefighters were here within 10 minutes of our call and we are in a really remote place," he said. "They sent five crews who were all very busy and were amazingly efficient. "The next time there's a firefighters' strike, I'm going to stand on the picket line with them." The main part of Mr Purves' house suffered some smoke damage while his mother-in-law lost most of her possessions to the fire. His wife, theatre actress Kathryn Evans, was away working in London. Firefighters from Saxmundham, Halesworth, Leiston, Southwold and Beccles had the fire under control by about 1400GMT.